Kelp is a type of large brown seaweed that is a staple to many Asian cuisines. The marine plant grows in shallow, nutrient-rich saltwater across the globe. The seaweed is often considered a superfood due to its significant mineral content. It’s especially concentrated in iodine, which is important for optimal thyroid function and metabolism,” nutritionist Vanessa Stasio Costa, M.S., R.D.N., C.D.N. said in an article on HealthLine.com. Seaweeds such as kelp are greatly valued for their high iodine content. Iodine helps regulate the body’s hormonal function and promote the overall health of the thyroid glands. The superfood’s high iodine content ensures healthy metabolism, proper enzymatic activity, and ideal temperature throughout the body. Likewise, kelp is widely known as an alkaline food. As a result, the superfood is touted for its ability to maintain a healthy acid-base balance in the body. The seaweed’s ample iodine supply is also found to offer protection against radiation poisoning. The seaweed is also notably high in powerful antioxidants that counter the harmful effects of free radicals and eliminate them from the body. Likewise, the fucoidan compound in kelp is touted to induce apoptosis or cell death among cancer-causing cells, but not in otherwise healthy cells. According to an article on the Organic Facts website, Asian women have long consumed kelp to prevent breast cancer. In addition, the superfood is known to contain a vast number of essential minerals — such as calcium, boron, zinc, copper and manganese — that help fortify the bones and reduce the odds of developing osteoporosis and other conditions associated with bone mineral deficiency. On the other hand, kelp is highly regarded for its high amino acid levels that promote cellular growth, muscle development and organ function. Moreover, kelp has an abundant supply of chlorophyll that helps bolster the body’s overall circulation. Chlorophyll is shown to promote red blood cell production, which in turn improves oxygenation, and organ function across the body. Likewise, the superfood is found to contain diuretic properties that help eliminate excess water. This also helps flush out unwanted toxins from the body. Furthermore, the superfood is known to contain antibiotic properties that help fend off a plethora of infections. Kelp is also touted for its rich iron, calcium, and potassium content that helps replenish the lost nutrients during monthly cycles. Likewise, the superfood is shown to improve skin, hair, and nail health. Kelp is particularly beneficial to the endocrine system. Likewise, the seaweed supports the immune, skeletal, and circulatory systems. In addition, the superfood promotes the urinary and female reproductive systems. Kelp can be incorporated in a variety of interesting recipes including vegetable dishes, salads, and soups. Likewise, the superfood can be incorporated to garnishes and even made into candied desserts. 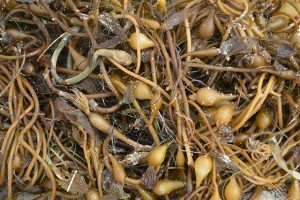 An article posted on the Maine Coast Sea Vegetables website features some kelp recipes curated across the web. Kelp prevents cancer, radiation poisoning, and osteoporosis. 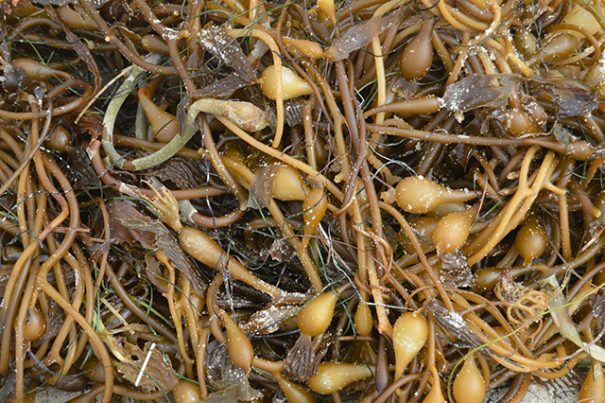 Kelp fends off infections and menstrual issues. Kelp promotes healthy endocrine, immune, and skeletal systems. Kelp supports the circulatory, urinary, and female reproductive systems.